ToxicWings was created from the former Hellz On Earth on 30 of December 2011. 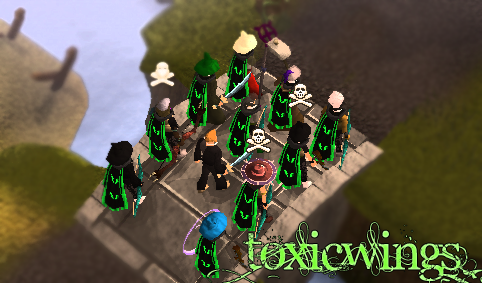 ToxicWings is PK-oriented clan, we have pktrips/wars and events everyday. We are massive multi-combat clan. We don't backstab our clan members, we don't cheat them, everyone respects other players and that's how we have gained our power. ToxicWings clan has been in many other games and private servers. For example, ToxicWings was very powerfull clan at Silkroad Online and is now taking over Runescape. We are the most powerful clan between combat 60-70. For new members, enjoy your stay and respect us, make us proud. At 17.01.2012 Combat range was change from 55-65 to 60-70. From 29.01.2012 clan leadership has been changed, Clan Leader is 99Britches from now on, and ToxicWaverz demoted himself as co-owner of the clan. Enjoy your stay at ToxicWings!